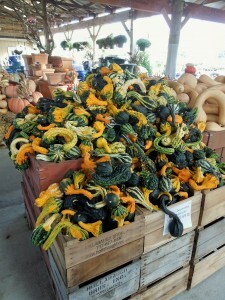 They catch your attention and are part of the fun during fall…I am talking about pumpkins. 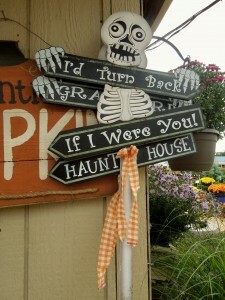 So many varieties this year. 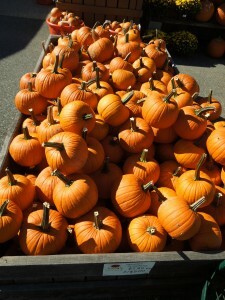 Most pumpkins are orange because of the high content of lutein, and alpha-beta-carotene. 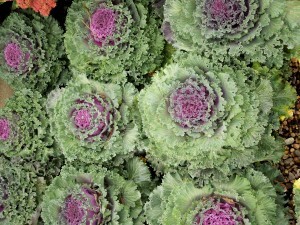 I love seeing them along with the gorgeous mums, cabbages and everything Fall and Witchy!! If you have been coming to the beach on our Second Season, I am sure you have driven by Tomato Sunshine. You cannot miss it. 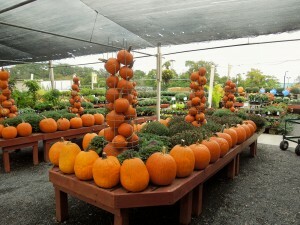 It is a giant pumpkin patch at this time of the year. Believe me, I know. I stop several times a week. Tomato Sunshine is so full of color, you cannot help but feel good. 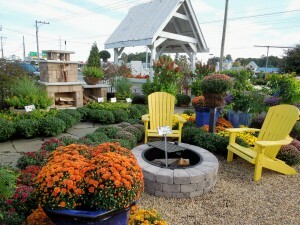 It is located at 19791 Coastal Highway, Rehoboth Beach, Delaware. 19971. Tel. 302-226-9533. Website? http://www.tomatosunshine.com. 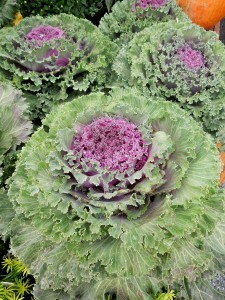 So when I stopped today I noticed that the cabbages are getting that deeper color. 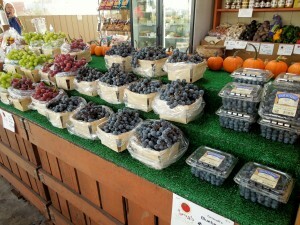 It was a bit chilly today and just perfect to walk around the market. 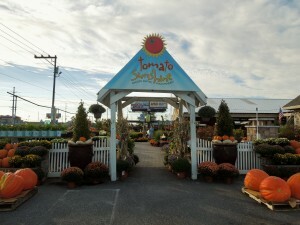 By the way, the Farm Market within Tomato Sunshine will be open through October 31st. 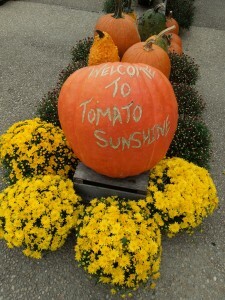 Tomato Sunshine opens Monday through Saturday from 9 a.m. until 6 p.m. Sunday from 9 a.m. until 5 p.m. 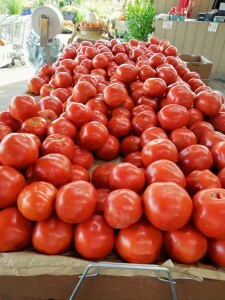 The tomatoes still looked beautiful. 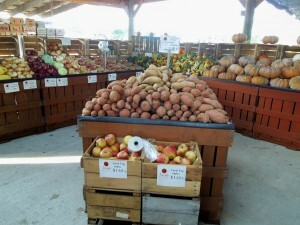 Plenty of other root veggies, onions, squashes. Tomato Sunshine will be fundraising for the Rehoboth Beach Fire Department on the week-end of October 26 – 28th which is the Sea Witch Festival. A scaffolding has been donated by Gran Rental Station to build the pumpkin tower that will light the night skyline on Rt. 1 (Coastal Highway). 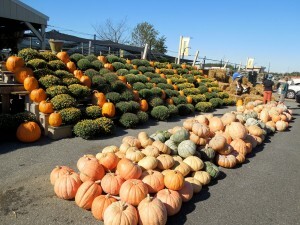 Pumpkin donation is $10 per pumpkin. 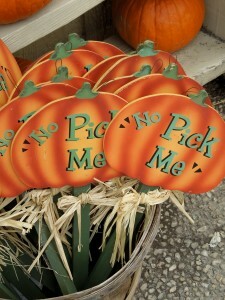 To reserve your pumpkin, please e-mail your info. to info@tomatosunshine.com. 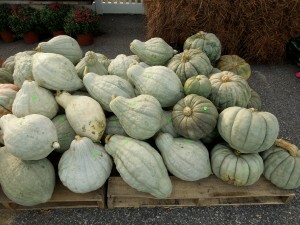 You can also e-mail ernie@tomatosunshine.com. Or, call 302-226-9533 for more details. You can check Tomato Sunshine’s Facebook page, as well. And, feel free to also visit their website above mentioned. More info. will be on those sites this week. 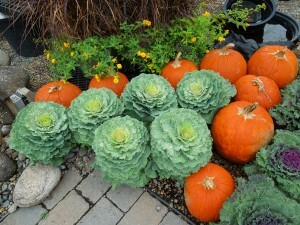 Ernie told me that there is a very good pumpkin this year at Tomato Sunshine. It is called the Buttercup. 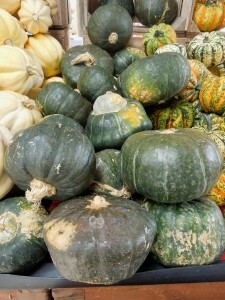 It is a winter squash with a sweet and nutty flesh. Easy to cook too. It seems that Tomato Sunshine has a slightly different look every day. You can always find something new. If you have any questions, please feel free to ask. They are very helpful. 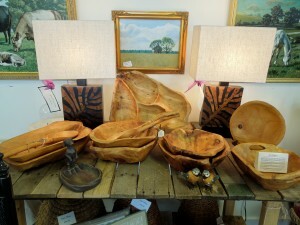 If you need fire wood, check the website. 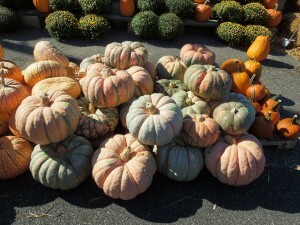 The following pumpkins are called Blue Hubbards. People love them. They are perfect for pies. 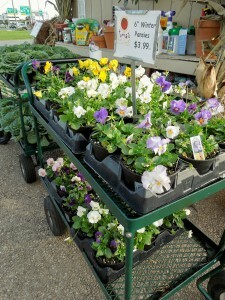 Don’t forget the winter pansies!! 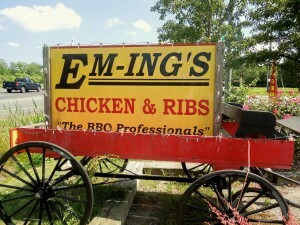 Passing through Em-ing’s I took a sharp turn when I saw the sign of Pig Roast Today. 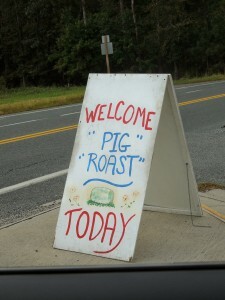 I had forgotten that every last Friday of the month there is a pig roast going on at this most popular B-B-Q place. They are located on the Corner of Rt. 113 and Rt. 610. If you are traveling south on 113 look for it after the Selbyville exit. You cannot miss it. Tel. 410-352-5711. The website is http://www.em-ings.com. Please check out the website, especially as the holidays approach. Mail order is big with Em-ing’s. 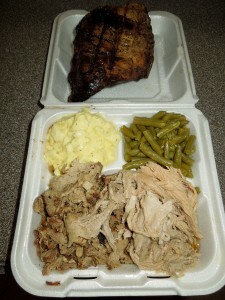 They also can do catering and fundraising events. So…there I was staring at the 200 lb. 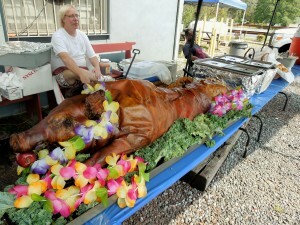 roasted pig. You get 2 sides with it; your choice of various items. I also got half a rack of babybacks. I love them!! Anyway, that’s all I have to tell you. 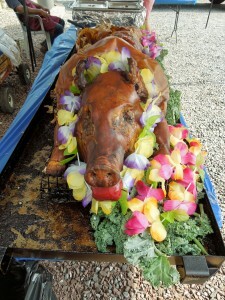 They will serve the roasted pig until it is all gone. But, don’t despair…another one will be on the last Friday of October. Note: Em-ings is open year-round. 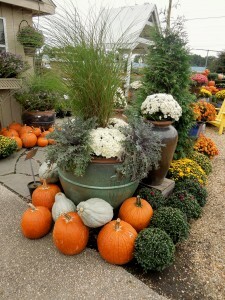 Saturday, October 6th, Lewes, Delaware, 17th Annual Boast The Coast, Maritime Festival, Boat Tours, Lewes Historical Society Craft Show, Lewes in Bloom Fall Plant Sale, Historic District Merchants’ Fall Sidewalk Sale, Seafood Tasting at 1812 Park, The Lighted Boat Parade, What a Day! 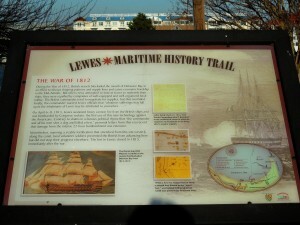 !, Come to Historic Lewes early and Stay Awhile! 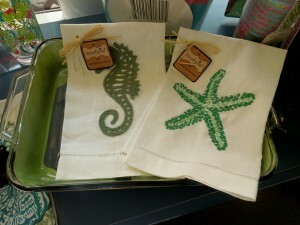 Hope you are coming to visit the Delaware Beaches….because, the Second Season is in full swing!! Historic Lewes, Delaware a packed Saturday, 10/6!! The Lewes Chamber of Commerce presents the 17th Annual Boast the Coast event that will be taking place in Lewes on Saturday, October 6th. 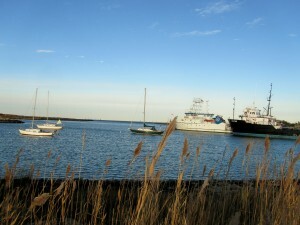 There will be maritime-themed activities throughout the day and into the evening. The Boast the Coast activities in 1812 Park and the City Dock, located along Front St. near Canalfront Park Marina, begin at 11:00 a.m. Other events taking place that day include the Lewes Historical Society Craft Show, the Lewes in Bloom Fall Plant Sale beginning at 9 a.m. and the Historic District Merchants’ Fall Sidewalk Sale from 10:00 a.m. until 5:00 p.m. The Lighted Boat Parade culminates the day’s activities at dusk on the canal. Lewes Mayor Jim Ford will announce the parade from the judge’s reviewing stand at Fisherman’s Wharf. 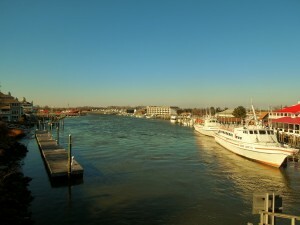 The free boat tours at the City Dock, located on Front Street, begin at 11:00 a.m. until 3:00 p.m. For the first time, the boat tours will be offered on the newest addition to the Lewes Canal – The Cape Water Taxi. The taxi will take passengers for a short ride on the canal. 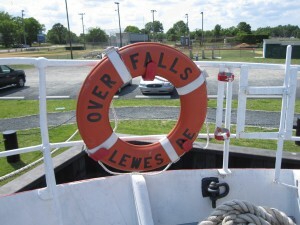 The Lewes Fire Department’s Fire Boat also will be at the City Dock, offering the opportunity to tour their vessel. A Seafood Tasting at 1812 Park will part of the festivities of the day. It will feature specialties priced individually, prepared by numerous chamber-member restaurants. The much loved, Family Fun Tent, will also be at 1812 Park, featuring entertainment by Flumpa the Tree Frog’s musical show, and Chuckles the Clown’s pirate-themed magic show. 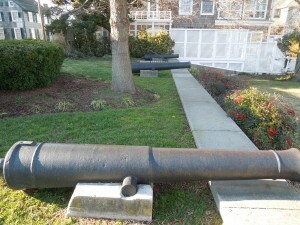 The Lewes Historical Society’s Maritime History museum located in the Cannonball House, located on Front Street, will open from 11:00 a.m. until 4:00 p.m. for free tours featuring their extensive collection reflecting Lewes’ maritime history. The Lightship Overfalls, berthed in the Canalfront Park on Front Street and designated a National Historic Landmark, will be open for free tours from 10:00 a.m. until 4:00 p.m. Boats participating in the Lighted Boat Parade will leave Roosevelt Inlet around 6:30 p.m. and arrive at the City Dock/Fisherman’s Wharf area around 7 p.m. The event chairman, Lewes Chamber of Commerce board member, Orville Mills, of George Sherman Corp. will serve as Head Judge and with the other judges will view the Lighted Boat Parade from the deck of one of the boats at Fisherman’s Wharf. Note: It does not cost anything for boat owners to enter the parade and all registered boat entries will be eligible for 3 cash prizes. To register, boat owners can pick up entries at the Lewes Chamber of Commerce visitor center in the Fisher-Martin House next to the Zwaanendale Museum or call 302-645–8073 to have one mailed. All registrations must be received by Noon, Saturday, October 6th!! More info? 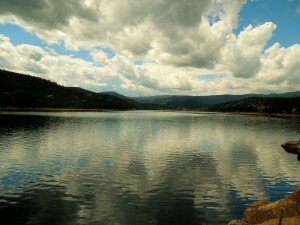 Please visit http://www.leweschamber.com. 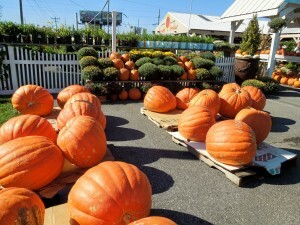 So…make plans because the Delaware Beaches have so much going on this season. Comments Off on Saturday, October 6th, Lewes, Delaware, 17th Annual Boast The Coast, Maritime Festival, Boat Tours, Lewes Historical Society Craft Show, Lewes in Bloom Fall Plant Sale, Historic District Merchants’ Fall Sidewalk Sale, Seafood Tasting at 1812 Park, The Lighted Boat Parade, What a Day! 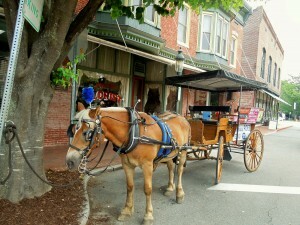 !, Come to Historic Lewes early and Stay Awhile! 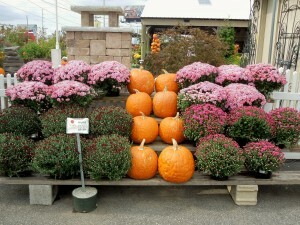 A full week-end will be October 5th through October 7th, in Rehoboth Beach. 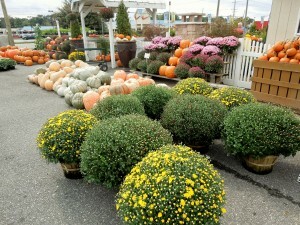 Among the many events that Rehoboth hosts every year, these are ones that people wait for, plan for and enjoy so much. Here is the information with websites and telephone numbers. All you have to do is come on down!! 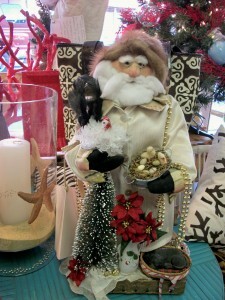 50th Annual Rehoboth Christmas Shop – For 50 years this event has been going on in Rehoboth Beach. 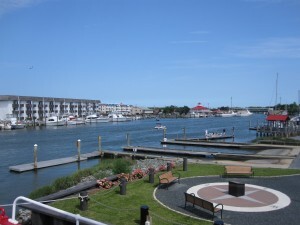 It will be held at the Rehoboth Beach Convention Center, located at 229 Rehoboth Avenue. It is presented by the Episcopal Church Women of All Saint’s Church in Rehoboth Beach and St. George’s Chapel, Harbeson, Delaware. Friday, Saturday, and Sunday. More info? Please call 302-227-7202. Website? http://www.allsaintsrehoboth.org. 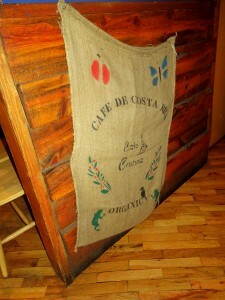 Unique gifts, clothing, jewelry, gourmet foods, holiday decor and much more. Admission is $1. Kids 12 and under are free. Luncheon served daily in the Christmas Cafe. Christmas Shop kick off Gala Preview Party will Thursday, 10/4 from 6 p.m. until 8 p.m. Complimentary food and beverages. Party donation is $30 at the door. All proceeds benefit local charities. 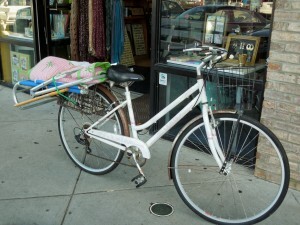 36th Annual Fall Sidewalk Sale. – Everybody loves a bargain. 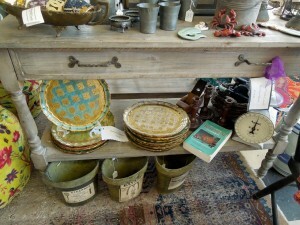 It is a week-end full of fabulous finds. Deals, deals, and more deals. Shop till you drop!! The sale starts on Friday and goes through Sunday. 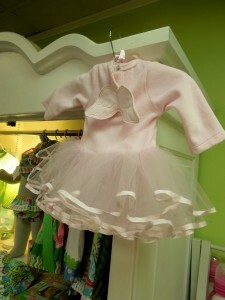 Shops open from 10 a.m. until 8 p.m. (store hours may vary). 2012 Rehoboth Beach Boardwalk Buddy Walk & Buddy Fest – Since 2006 – Walking for Down Syndrome in Rehoboth Beach, Delaware – Register or donate online at http://www.boardwalkbuddywalk.com. Friday, October 5th is the Buddy Up Party at the Dewey Beach Lions Club Community Center located 115 McKinley St. & The Bay in Dewey Beach. 5 p.m. until 8 p.m. Plenty of free food and entertainment. Fabulous Silent Auction. Tip well at the cash bar as the Lions Club bartenders will donate their tips to the cause. Free soft drinks for the kids. Free walker registration at the party. 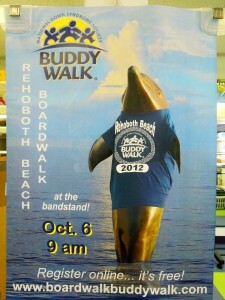 On Saturday, 10/6 – Buddy Walk at Rehoboth Beach Boardwalk & Bandstand. Registration at 7:30 a.m. Walk starts at 9:00 a.m. All information is on the above mentioned website. Please note that 100% of the net proceeds are donated to organization that provide social, educational, and occupational opportunities, and care to people with Down Syndrome. 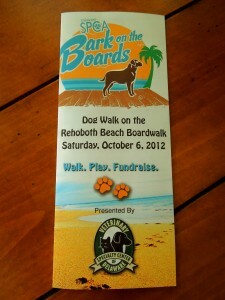 Delaware SPCA Bark on the Boards – Dog Walk on the Rehoboth Beach Boardwalk on Saturday. Walk. Play. Fundraise. The Delaware SPCA is an independent 501(c)(3) non-profit organization. There is no umbrella “SPCA” organization and the Delaware SPCA does not receive State or County funding. They rely on donations to make their live saving work possible. The walk starts at Lake Gerar Park with 10 a.m. registration and 11 a.m. walk. The Grand Marshals will be Delaware SPCA Alumnus, Mr. Beefy, and members of the US Coast Guard. Mr. Beefy went from shelter dog to official military dog when he was adopted by the Coast Guard Station at the Indian River Inlet. He will kick off the Walk!! Register online by visiting http://www.delspca.org. New this year are Virtual Walkers. Even if you cannot make it to the dog walk, you can be a virtual walker in the event. Participate from anywhere, raise money and compete for fundraising prizes! Same registration fee applies. More info? Please visit http://www.delspca.org. Step Up for Animals – Raise the most money and your dog will be featured at Top Dog 2013 for next year’s walk. Your pup will be included in event publicity, kick off the walk in 2013, and win a “Top Dog” trophy. 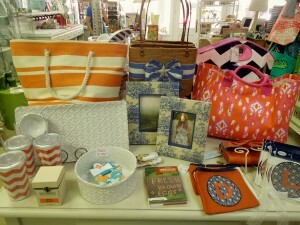 Will be a full week-end at the Delaware Beaches!! 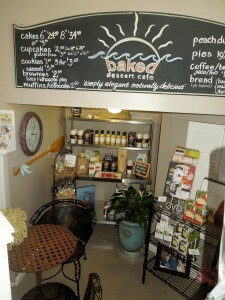 Baked Dessert, Cafe, Gallery, Historic Berlin, Maryland, Organic Lunch, Vegan Lunch, Certified Organic Wines, Cakes, Pies, Gluten Free, Low Sugar Desserts, Artisan Breads, Local Cheese…Peach Dumplings, Cupcake Bombs!! 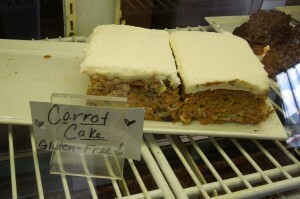 On my strolling through the Historic town of Berlin, Maryland, with my friend, Debbie K., we found Baked Dessert. It is located at 4C Bay Street. Tel. 410-641-1800. Website? http://www.bakeddessertcafe.com Even though we thought we did not need any “sweet endings” after our lunch, already a friend had told us that the Cupcake Bombs at Baked Dessert would be something we should try. OMG…they were so good!! No guilt because they are small. If you eat them at Baked Dessert, which by the way, has indoor seating in a cafe style setting, they will be served warm with a tiny spoon so that you can scoop all that melted chocolate inside or peanut butter. 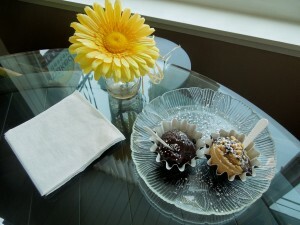 Debbie and I sat by the window to enjoy them. Baked Dessert is a Green Business. 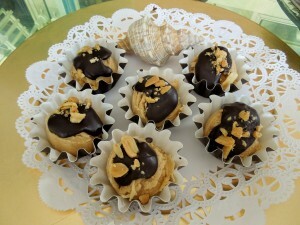 Their ingredients are free of artificial colors, flavors, preservatives and trans-fats. It has already received substantial awards from the community and its customers. 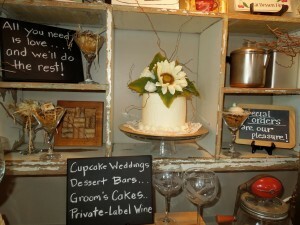 You will find specialty desserts, artisan breads, local cheeses, cakes, sweet breads and pies. 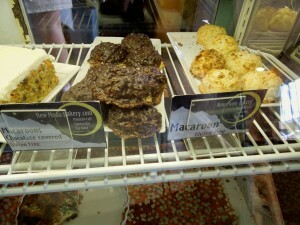 Baked Dessert also has gluten free cupcakes, macaroons, trouffles, rice pudding and granola. 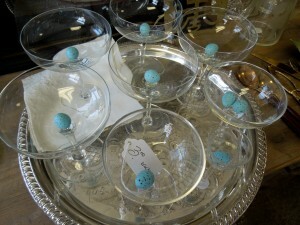 Have a wedding or other celebration…they take custom orders. 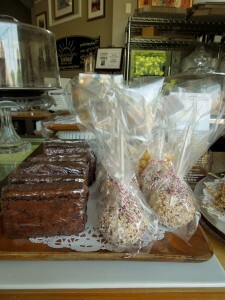 Stop for lunch and have an organic and vegan lunch, or, do like we did; for dessert and coffee. 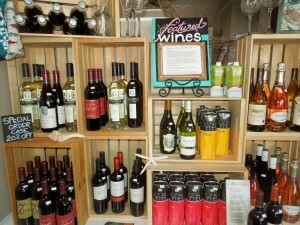 The day we visited, the featured wines were Yellow & Blue which are certified organic. 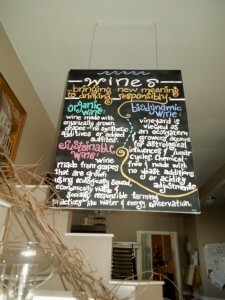 The Cafe pays attention to sustainable, bio-dynamic and organic wines. 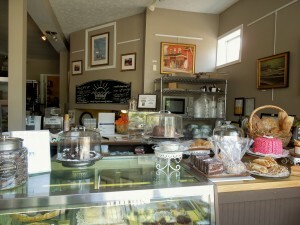 Bake Dessert Cafe opens Monday through Friday from 10 a.m. until 6 p.m. Saturday 10 a.m. until 4 p.m. It does close on Sunday. 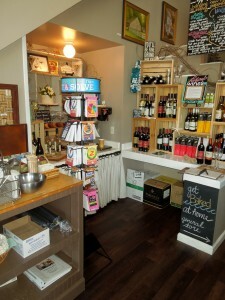 On 2nd Fridays in Berlin, Bake Dessert will open from 10 a.m. until 8 p.m. with wine tasting from 5 p.m. until 8 p.m.
Free WiFi is available in the Cafe for customers with purchase. Bake Dessert Cafe is cozy and comfortable. While you are having something to eat, enjoy the local art by local artists including works by renowned artist, Patrick Henry. 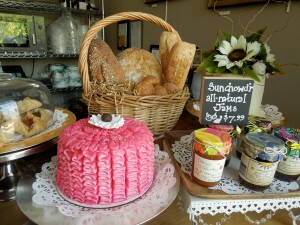 Wonderful aromas….of course, it is a bakery!! 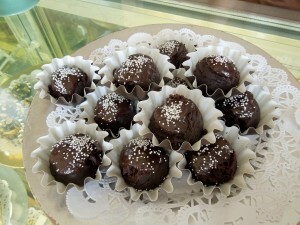 Comments Off on Baked Dessert, Cafe, Gallery, Historic Berlin, Maryland, Organic Lunch, Vegan Lunch, Certified Organic Wines, Cakes, Pies, Gluten Free, Low Sugar Desserts, Artisan Breads, Local Cheese…Peach Dumplings, Cupcake Bombs!! 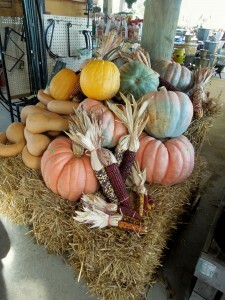 I took a walk this morning and what a change from yesterday’s almost summer weather to….Hello Fall!! It is one of those days; perfect to get in the car and drive to the Historic Town of Berlin, Maryland. 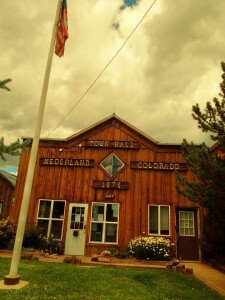 This town dates back to the 1790’s. 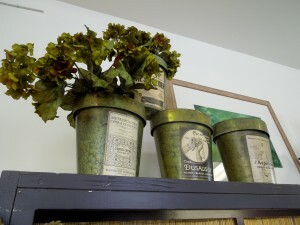 It is preserved in such a way that you really get a feel what it would have been like so many years past. 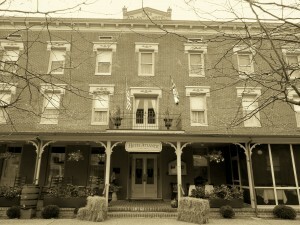 The Atlantic Hotel is a perfect example. Since 1895 it has had a presence in Berlin. Right in the center of Historic Berlin. Lunch, dinner or enjoy a drink at the bar. I have had lunch there many times. This last time I was with my friend Debbie. We sat out on the porch which is great because you can see the comings and goings of this charming town. 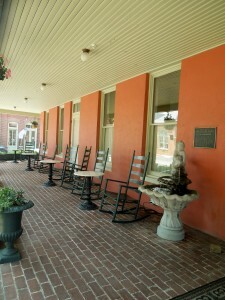 The Atlantic Hotel is located at 2 North Main St. Tel. 410-641-3589. Website? 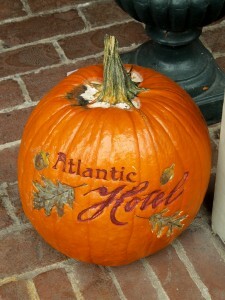 http://www.atlantichotel.com. 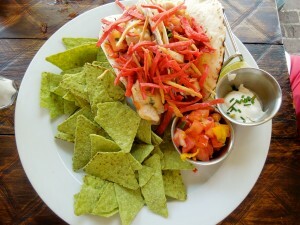 Our lunch consisted of Fish Tacos, tasty and colorful. 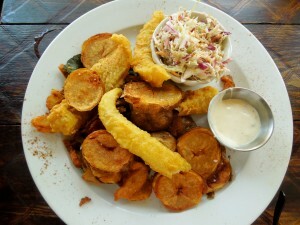 The Fish & Chips were so good. I have not had them in a long time and it was a special of the day. That’s was lunch, perfectly satisfied. Nothing else was needed. Strolling through Main Street took us to TaDa. 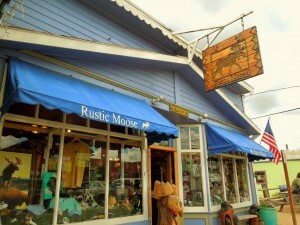 This shop is owned by a Mother & Daughter Team; Patty & Blair. 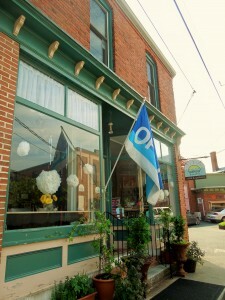 TaDa is located at 18 N. Main St., Berlin, MD 21811. Tel. 410-641-4430. TaDa has gifts for everyone on your list. Personal attention and warm smiles…always!! 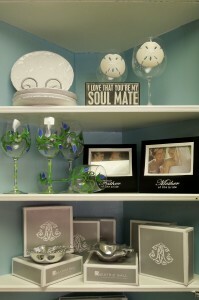 For the brides there are plenty of gifts. Babies are also coming into the picture. 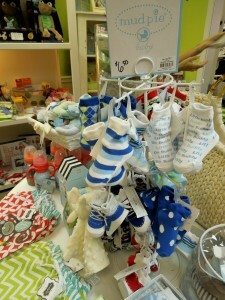 TaDa also has a line for infants. 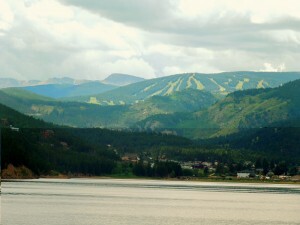 Whatever you are doing today…have a good one because it is certainly pretty out there!! 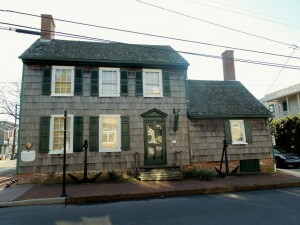 Historic Berlin, Maryland is only about 6 or 7 miles from Ocean City, Maryland. From the Delaware Beaches, the drive is scenic, especially at this time of the year. If you live here, you probably know the shortcuts; the back roads. 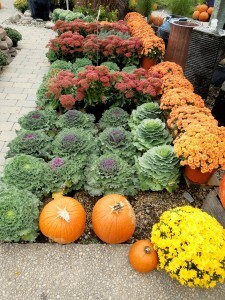 This historic town is beautiful all year-round, but in the fall it is sooo pretty!! Park on Main Street and walk to the restaurants, shops, bake shops, and wine bars. 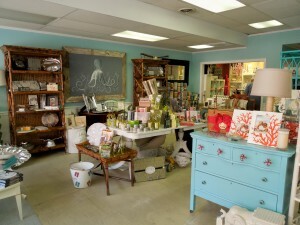 One of the shops to check out is NEST, located at 11 South Main St. It opens Monday through Saturday from 10 a.m. until 5 p.m. Sunday from Noon until 4 p.m. Tel. 410-629-1030. You can find NEST on Facebook. The shopkeeper is Dee. I have known her for a long time. She is so friendly and an amazing artist. 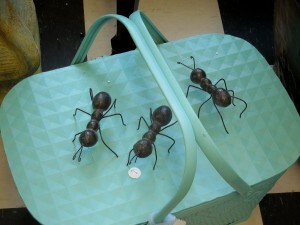 Her aprons and bags are sought after. The fabrics changing with the season. 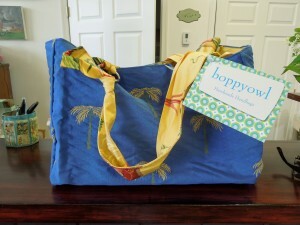 I bought this blue bag with palm trees for my friend, Marisa, when I visited her in Colorado in August. She loved it!! You do not want to miss her Santas during the holidays. 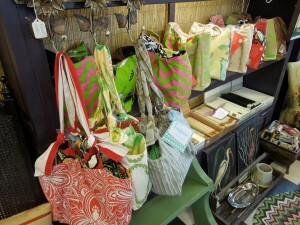 All handmade with rich fabrics. 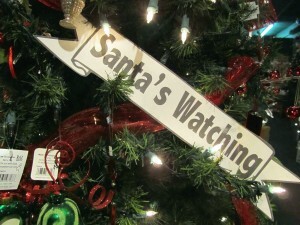 Definitely, they are collectors’ santas. 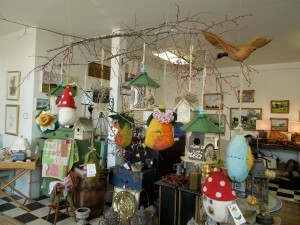 NEST has always something new; something for everyone. The merchandise moves quickly. One thing that never changes is Petey. 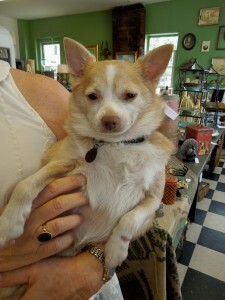 He is the mascot and is always there to greet customers. 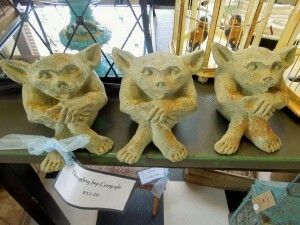 The store has eclectic and funky items; one of a kind fun pieces. 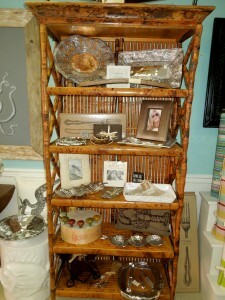 Decorative pieces and local artwork. Showers, and wedding presents….NEST has plenty.